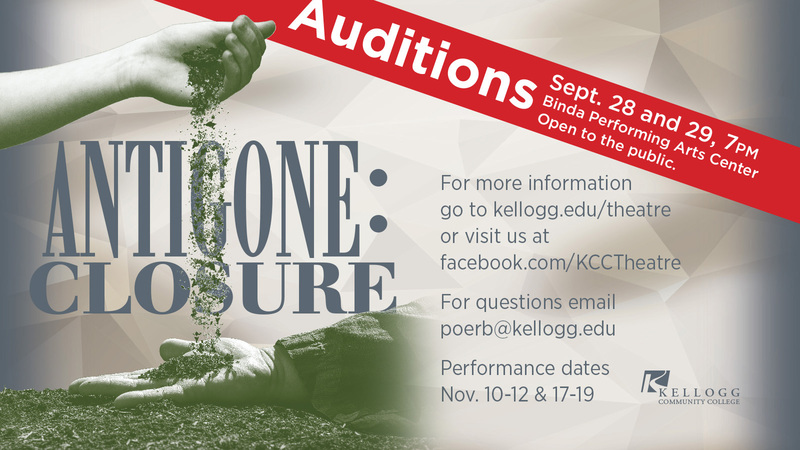 Auditions for Kellogg Community College’s fall play will be held today and tomorrow, Thursday and Friday, Sept. 28 and 29, at the Binda Performing Arts Center on campus in Battle Creek. Titled “Antigone: Closure,” the play is a new, gritty, contemporary adaptation of Sophocles’ classic Greek tragedy “Antigone.” Set after the fall of the American civilization, the plot centers on the members of a once-proud family who struggle to maintain control over a beleaguered city, while one woman is forced to choose between the call of honor and love or respecting the rule of law. Auditions each night begin at 7 p.m. and will consist primarily of cold readings of selections from the script, which can be viewed here online. For more information, see audition details on the KCC Theatre Facebook page or email director and Theatre Program professor Brad Poer at poerb@kellogg.edu.